The Yankees have won 16 of their last 17 games — the last time they did that, Billy Martin was a player and a few of those 16 wins came against the St. Louis Browns — and when you go on a run like that, it takes more than just good hitting or good pitching to make it happen. You need to do everything well. Following last night’s game the Yankees own a 2.06 (2.54 FIP) during the 16-1 stretch, and they’re averaging only 2.29 runs allowed per game. Ten times in the 17 games they’ve allowed no more than two runs. They haven’t allowed more than six runs in any of the 17 games, and, when you consider who and where they’ve played, that’s pretty incredible. Offensively, the Yankees are averaging 5.94 runs per game and hitting .243/.326/.444 overall during the 16-1 stretch. Lately though, they’ve played some real close games and had to eke out wins with late-inning rallies. There were two go-ahead ninth inning rallies in Houston, two walk-off wins over the Indians, and last night’s one-run over the Red Sox. One constant during this 16-1 stretch — and really the entire season — has been timely hitting. I’ve been doing this long enough to know every fan base thinks their team stinks with runners in scoring position. Go 4-for-12 with runners in scoring position and you’re hitting .333! But you also screwed up eight times. Fans seem to remember the eight more than the four.
? Getting hits with runners in scoring position is cool, you kinda need to do that over the long haul to win games, but when it comes to getting the proverbial big hit, I prefer to look at high leverage stats because they include context for the game situation. A bases loaded single in the seventh inning of a tie game and a bases loaded single in the second inning with a six-run lead are both hits with runners in scoring position. Leverage Index knows the seventh inning hit did more to create a win. Offensively, the Yankees lead baseball with +4.40 win probability added, which essentially means they’ve added four wins plus 40% of another win to their ledger through timely hitting alone. The Red Sox are a distant second with +2.82 win probability added. The Yankees are lapping the field in high leverage situations. Furthermore, in these high leverage situations, the Yankees as a team have an 11.5% strikeout rate and a 16.8% walk rate. Remove intentional walks and it’s still an 11.9% walk rate. That is pretty awesome. The Yankees currently have a 24.2% strikeout rate overall, ninth highest in baseball, but in high leverage spots their strikeout rate is three percentage points lower than the next best team (Pirates at 14.5%). Who knew? Of course, we are talking about a small sample size here — the Yankees as team have only had 113 high leverage plate appearances — so there is going to be some noise. Gleyber Torres is 4-for-4 with two walks in high leverage spots. Miguel Andujar is 5-for-10 with a walk. Tyler Wade is 1-for-1! Stuff like that won’t last forever. The point here is that the Yankees have been a great high leverage hitting team to date. That .322/.429/.522 (152 wRC+) line in high leverage spots happened, it’s in the books, and it’s helped the Yankees win an awful lot of games. I don’t think any team has a true talent 152 wRC+ offense in high leverage spots though, so we’ll probably see a correction at some point. That won’t be fun, but hey, enjoy this while it lasts. As with runners in scoring position, high leverage numbers are descriptive rather than predictive. They tell you what already happened. They’re not so good at telling you what’ll happen next. I’m an agnostic when it comes to “clutch” and things like that. Good hitters tend to be good hitters in all situations. The Yankees have been great in clutch situations so far. Will it continue? Hope so! 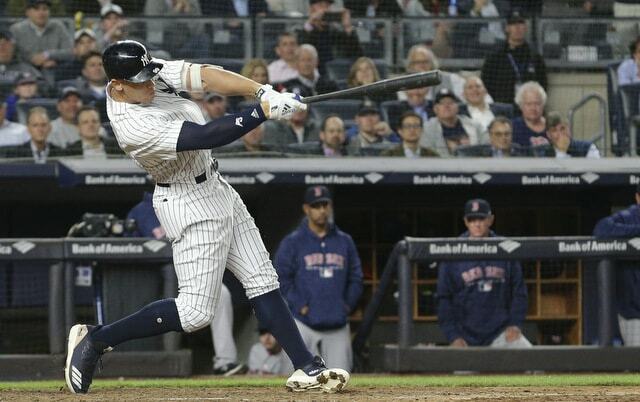 The Yankees certainly have not been firing on all cylinders offensively the last week or so — facing the Astros’ and Indians’ pitching staffs will do that — yet they continue to win because the pitching has been very good, and when it gets down to crunch time in the late innings, the bats have been to come through time and time again.